Translated by Rev. 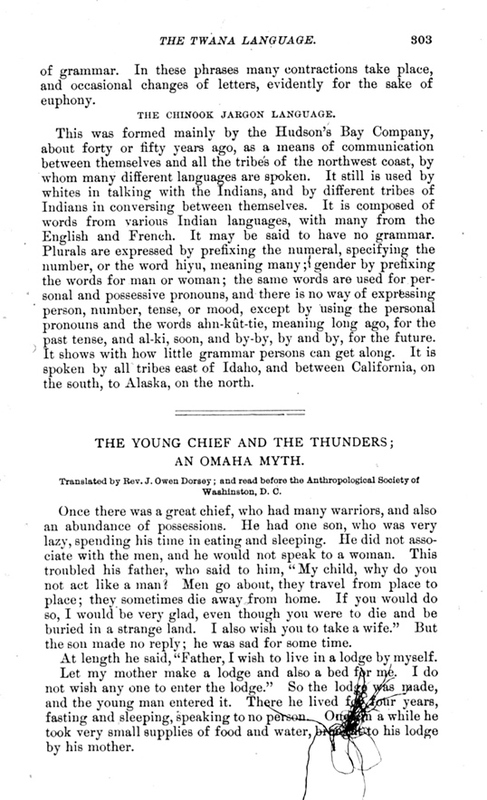 J. Owen Dorsey; and read before the Anthropological Society of Washington, D.C.
Once there was a great chief, who had many warriors, and also an abundance of possessions. He had one son, who was very lazy, spending his time in eating and sleeping. He did not associate with the men, and he would not speak to a woman. This troubled his father, who said to him, "My child, why do you not act like a man? Men go about, they travel from place to place; they sometimes die away from home. If you would do so, I would be very glad, even though you were to die and be buried in a strange land. I also wish you to take a wife." But the son made no reply; he was sad for some time. At length he said, "Father, I wish to live in a lodge by myself. Let my mother make a lodge and also a bed for me. I do not wish any one to enter the lodge." So the lodge was made, and the young man entered it. There he lived for four years, fasting and sleeping, speaking to no person. 0nce in a while he took very small supplies of food and water, brought to his lodge by his mother. And it happened, while he fasted, that he thought in his heart, "Let me see: I will wear a garment made of scalps." And a Wakanda or spirit told him that he should do whatever he desired. "You shall go on the war-path. Soon after you leave home, you will reach the lodge of an old-man Thunder." And he told the young man what to do, promising him the garment of scalps. Then the youth called to his father, and asked him to send for some of the young men, as he wished them to go with him on a journey. So all the men of the tribe were assembled, and the young chief selected his associates. They were a very large company. He told them that they were to go with him on the war-path, which gave them great pleasure. In four days they started on the war-path. At length they came to an old man who was very poor. He was a Thunder, but none of the party knew that but the chief. And they pitied him, saying, "Let us give him some of our robes and other goods." They did so. Then the old man said, "You think that you have been kind to me. I will be kind to you. I will speak to you about something." When he had said this, a coyote, which was the servant of the old man, and which stood at the door, gave a wink to the chief, who followed him out of the lodge. Said the coyote, "When he tells you to choose one of the four sacred bags, take the old otter skin. All are good, but that is the best." Then the chief and the coyote re-entered the lodge. And the old man said again, "You have been kind to me; and I will be so to you. Which of these four sacred bags will you take If you wish to return with scalps, etc., in half a day, take the swallow bag. If you select the hawk, you will return in two days with your booty. Should you desire to be away a little longer, take the third. This otter skin one is good, but it is old and worn." 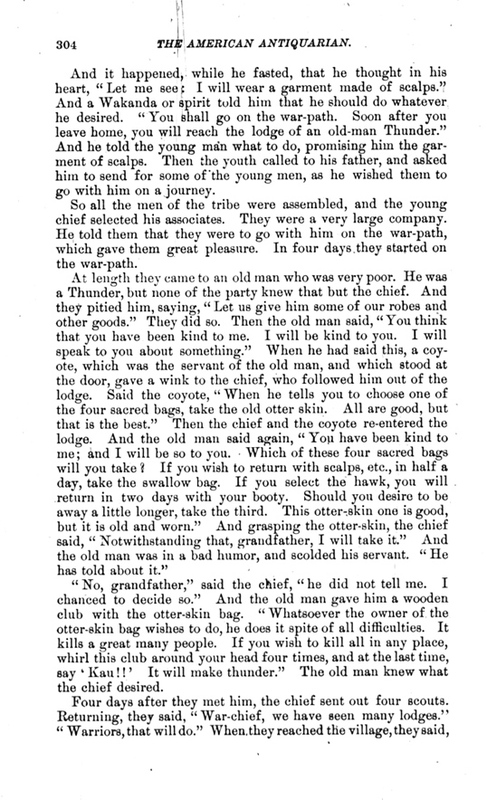 And grasping the otter-skin, the chief said, "Notwithstanding that, grandfather, I will take it." And the old man was in a bad humor, and scolded his servant. "He has told about it." "No, grandfather," said the chief, "he did not tell me. I chanced to decide so." And the old man gave him a wooden club with the otter-skin bag. "Whatsoever the owner of the otter-skin bag wishes to do, he does it spite of all difficulties. It kills a great many people. If you wish to kill all in any place, whirl this club around your head four times, and at the last time, say 'Kau!!' It will make thunder." The old man knew what the chief desired. "War-chief, we have come to the village." "0, my warriors, I am not seeking that." There were similar occurences on three successive days. On the fourth day, he sent out scouts again, saying, "Warriors, should one of your grandfathers be there, do not kill him." And the men met a buffalo. After some disputing, one shot it. And the buffalo killed him. 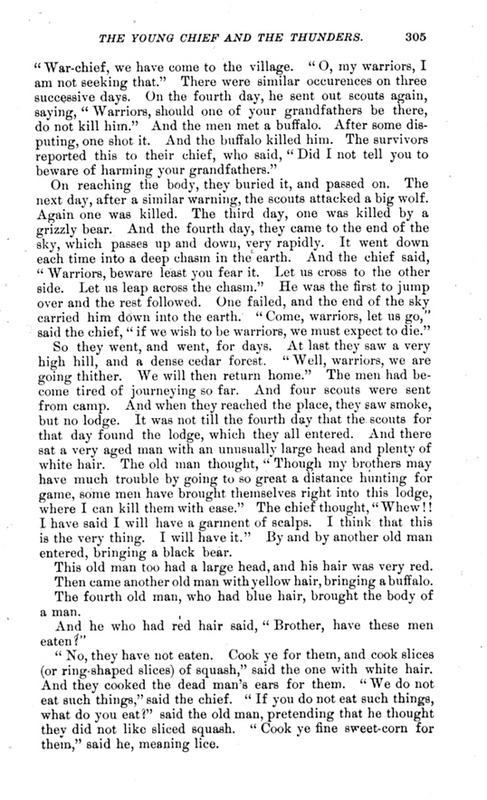 The survivors reported this to their chief, who said, "Did I not tell you to beware of harming your grandfathers." On reaching the body, they buried it, and passed on. The next day, after a similar warning, the scouts attacked a big wolf. Again one was killed. The third day, one was killed by a grizzly bear. And the fourth day, they came to the end of the sky, which passes up and down, very rapidly. It went down each time into a deep chasm in the earth. And the chief said, "Warriors, beware least you fear it. Let us cross to the other side. Let us leap across the chasm." He was the first to jump over and the rest followed. One failed, and the end of the sky carried him down into the earth. "Come, warriors, let us go," said the chief, "if we wish to be warriors, we must expect to die." So they went, and went, for days. At last they saw a very high bill, and a dense cedar forest. "Well, warriors, we are going thither. We will then return home." The men had become tired of journeying so far. And four scouts were sent from camp. And when they reached the place, they saw smoke, but no lodge. It was not till the fourth day that the scouts for that day found the lodge, which they all entered. And there sat a very aged man with an unusually large head and plenty of white hair. The old man thought, "Though my brothers may have much trouble by going to so great a distance hunting for game, some men have brought themselves right into this lodge, where I can kill them with ease." The chief thought, "Whew!! I have said I will have a garment of scalps. I think that this is the very thing. I will have it." By and by another old man entered, bringing a black bear. This old man too had a large head, and his hair was very red. Then came another old man with yellow hair, bringing a buffalo. The fourth old man, who had blue hair, brought the body of a man. And he who had red hair said, "Brother, have these men eaten?" "No, they have not eaten. Cook ye for them, and cook slices (or ring-shaped slices) of squash," said the one with white hair. And they cooked the dead man's ears for them. "We do not eat such things," said the chief. "If you do not eat such things, what do you eat?" said the old man, pretending that he thought they did not like sliced squash. "Cook ye fine sweet-corn for them," said he, meaning lice. And when the chief saw what it was, he said, "We do not eat such things." And one of the Thunders said, "Let them cook the bear and buffalo for themselves." And the men were very joyful. Having done their own cooking, they had pleasure in eating. Then it was night. After the meal, the old man with white hair said, "My grandchild, when a man travels, he has many things to talk about. Tell about yourself." 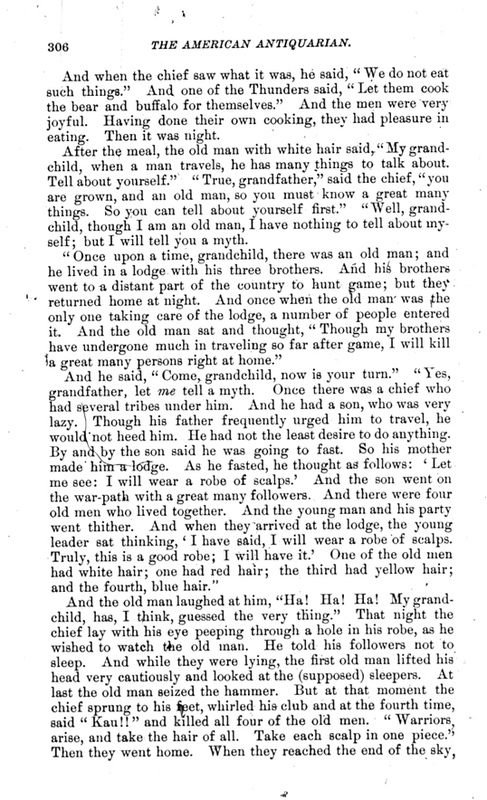 "True, grandfather," said the chief, "you are grown, and an old man, so you must know a great many things. So you can tell about yourself first." "Well, grandchild, though I am an old man, I have nothing to tell about myself; but I will tell you a myth. "Once upon a time, grandchild, there was an old man; and he lived in a lodge with his three brothers. And his brothers went to a distant part of the country to hunt game; but they returned home at night. And once when the old man was the only one taking care of the lodge, a number of people entered it. And the old man sat and thought, "Though my brothers have undergone much in traveling so far after game, I will kill a great many persons right at home." And he said, "Come, grandchild, now is your turn." "Yes, grandfather, let me tell a myth. Once there was a chief who had several tribes under him. And he had a son, who was very lazy. Though his father frequently urged him to travel, he would not heed him. He had not the least desire to do anything. By and by the son said he was going to fast. So his mother made him a lodge. As he fasted, he thought as follows: 'Let me see: I will wear a robe of scalps.' And the son went on the war-path with a great many followers. And there were four old men who lived together. And the young man and his party went thither. And when they arrived at the lodge, the young leader sat thinking, 'I have said, I will wear a robe of scalps. Truly, this is a good robe; I will have it.' One of the old men had white hair; one had red hair; the third had yellow hair; and the fourth, blue hair." the chief told the warriors to precede him and jump over. He went last of all, and running very fast he made a flying leap, bringing up the man from the ground, and reaching the other side with him, both being alive. Then ariving at the grave of the man killed by the bear, he did in like manner. He ordered each of his followers to jump over the grave in succession. He, himself, was the last to jump; and as he did so, up came the man alive again. The next day they came to the grave of the man who had been killed by the wolf. 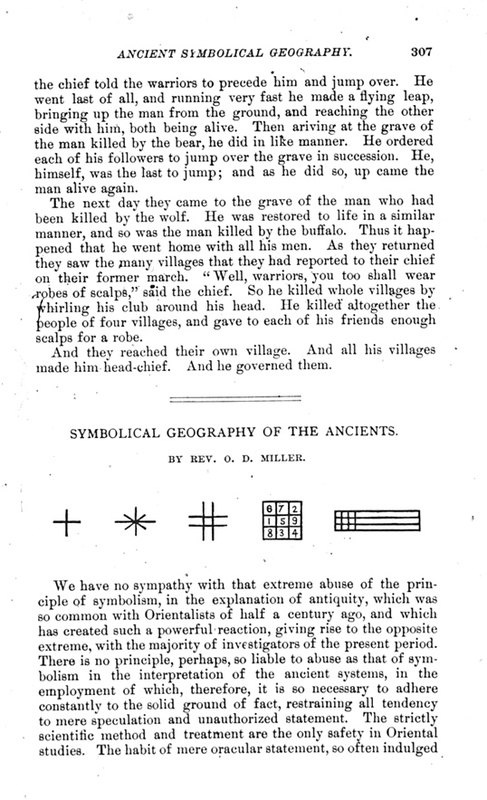 He was restored to life in a similar manner, and so was the man killed by the buffalo. Thus it happened that he went home with all his men. As they returned they saw the many villages that they had reported to their chief on their former march. "Well, warriors, you too shall wear robes of scalps," said the chief. So he killed whole villages by whirling his club around his head. He killed altogether the people of four villages, and gave to each of his friends enough scalps for a robe. And they reached their own village. And all his villages made him head-chief. And he governed them.